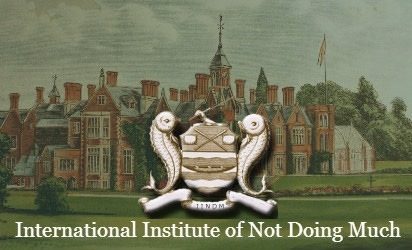 Thank you for your message of appreciation and support (sent four years ago) for our vital work in not doing much here at the Institute. It was our pleasure to host members of the Dudeist priesthood at Crumpetworthy Hall. Frankly, it was a surprise when your delegation showed up at the porter’s lodge that rainy afternoon back in September. We’d like to again apologize for the behavior of Sgt. Dim Whittington of slow security. You’ll be happy to know he’s responding well to the massage therapy and has a much looser attitude to life in general. We have much to thank you for. Bowling has not been a traditional pastime of the International Institute of Not Doing Much— until now. Many of our members are deriving great benefit from this spiritual practice and we particularly like to thank your technical assistance with getting the steam generator to work the new bowl-o-meter contraption in the East Tower. All of us here are glad your priesthood wants to know much more about the history and practice of hammockery (the art and science on lounging in a hammock). In fact you probably heard about the consternation in the hammock room as your delegation showed us The Big Lebowski. Of course, The Dude, an utterly admirable man with such a refined sense of not doing much (and clearly one of us), was soaking in a cruelly insignificant sized bathtub. This was very upsetting for our members to witness. However, your delegation became particularly interested in ancient practice of bathology. The residents of Crumpetworthy Hall did not know that America has not embraced the bathtub. Hotels across the country have poor excuses for tubs and none of the hotel promotional material addresses the needs of the soaking connoisseur. We hope that your enthusiastic experience of extra-deep-clawfoot tubbing will stimulate the economy in the United States. One of our most sacred practices is to spend extended periods soaking. In fact, I’m writing this letter to you from ground floor tub room where I have been soaking these last four days. I’m glad we ironed out the initial misunderstanding about the carpet. We are all friends now. Please visit us again. We look forward to seeing you again. Far Out!!! Another worthy organization worth looking into.